Today we learned about sublimation in science. What better way to demonstrate sublimation than with dry ice. Ever since I made my first "witches brew" a few years ago I have been a little bit obsessed with dry ice. I have made cakes, punch, and of course experiments. 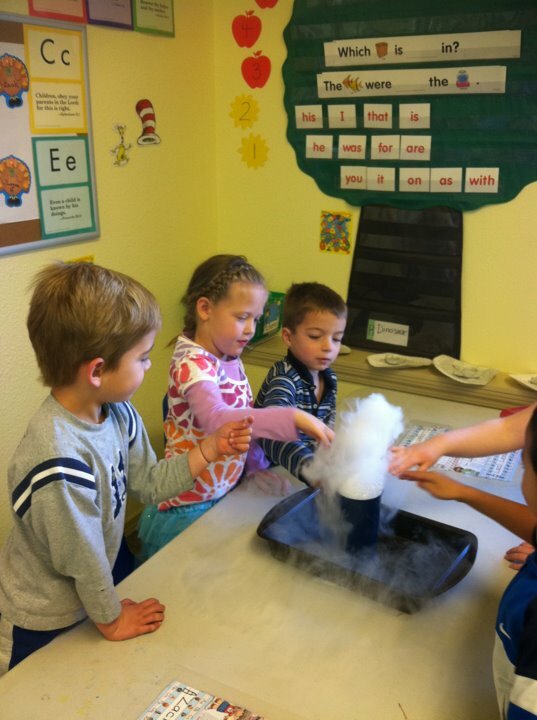 Today we discussed the properties of solid, liquid and gas. Then we talked about how sometimes solid goes straight to a gas. 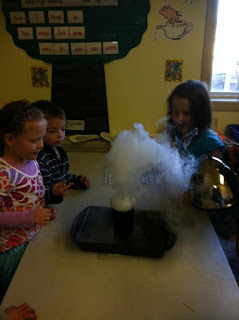 We put dry ice in a cup and poured hot water in the cup. The kids were amazed at the "gas" billowing out of the cup. To speed up the process and to make it just plain fun we added soap to the cup. It made giant bubbles that when popped released clouds of "gas". The kids squealed with delighted as they popped each gas filled bubble. This is an experiment I would fully recommend!!! Remember to be extra careful not to touch the dry ice! By through this website I came to know about Super Science Sublimation Experiment. It is one of the best options for us.